National Mission for Empowerment of Women invites applications for the recruitment of various professionals to run State Resource Centre for Women (SRCW) Dehradun and Poorna Shakti Kendra (PSK) Haridwar. NMEW has released an advertisement for the recruitment at various posts in Haridwar & Dehradun centres. Interested and eligible candidates can send their fully filled application form with attested documents photocopies by registered post to following address till 14 October 2016. 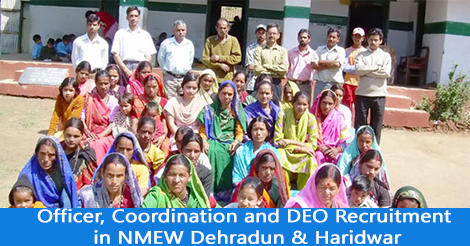 Help us to improve this article/job posting "Officer, Coordination and DEO Recruitment in NMEW Dehradun & Haridwar". We would be glad if you can comment below and provide your valuable suggestions and feedback. If this page have any wrong information/list or out of context content, then you can report us as well.